This point might not be very known worldwide, but inside Japan it’s quite something to talk about. The well-known kira kira names (きらきらネーム) are a kind of names that people give to their children here in Japan which are not quite Japanese names. As a family name, the great majority of people uses kanji, as it follows the previous generations and is a family tradition. However, the first name has some level of freedom. 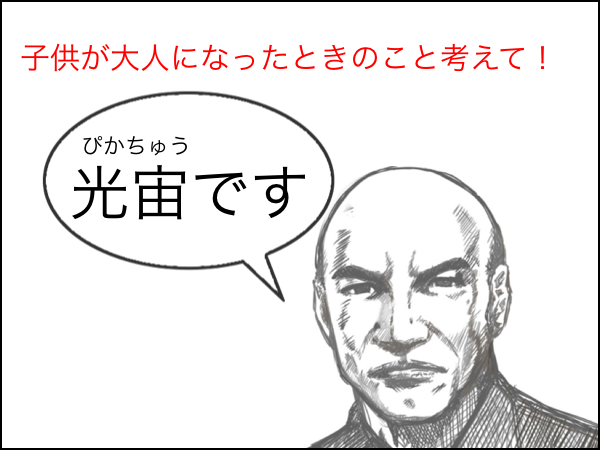 People may use kanji, hiragana, or even the combination of both. But where do kira kira names fit in here? Well, as you know, kanji characters have basically two readings, the on-yomi (reading originated from Chinese) and kun-yomi (reading originated from Japanese). Sometimes there are more than two readings and sometimes even only one, as there are a lot of exceptions. Despite all of that, when Japanese people choose a kanji name for their children, usually they think about its meaning, for example how they want their child to grow, etc. However, in the case of kira kira names, the sound, not the meaning, is the main choice reason. The combinations are so… hum… exquisite (!) that names sound like characters from animation films or games. These names exist for quite some time now, but the issue exploded recently when an elementary school class student list, loaded with kira kira names, floated on the net. Nobody knows if the list was real or a not, but it sure did shocked everyone. It’s not just a case of how it sounds, as there are a lot of problems involved, like having your name correctly read in a hospital, important documents, being called at school, or even making your self-introduction in a job interview. Even Prime Minister Abe complained about kira kira names saying “Many of these kids with kira kira names get bullied.” He also went on to say that parents should take a more sober approach in naming their kids, because it is “different from naming your pets”. But let me show you how kira kira names really look and sound like. Enjoy the list below. Two great videos that will make your day!